"I am a true believer in the importance of manufacturing to our economy." named Chandra Brown its executive director, charging the veteran industrial professional with leading their efforts to, in their words, “Make every part better than the last.” You can find her full bio here. Smart Industry: Describe your role. Chandra: In recent years I have worked on overarching policy focused on making U.S. manufacturing more competitive—exploring what we were not doing compared to other countries in terms of advanced manufacturing. I like the idea of building something, coming full circle from ideation to helping get these institutes set up and funded to now running of one of them. It’s great to see the whole cycle. Smart Industry: What does running DMDII entail? Chandra: The U.S. Department of Defense has invested millions in this institute. We’re trying to provide better processes and cutting-edge work that will benefit our war-fighters and our member companies. We are trying to incorporate cutting-edge technology and software projects our member teams—outcomes, products, papers—all to benefit the whole ecosystem in the digital advanced-management space. Smart Industry: What projects are you working on? Chandra: We have our Future Factory Workshop. Siemens is one of our big partners, with their digital twin initiative here. We have the McKinsey Digital Capability Center running now. I have inherited 60 projects that have been in the works. Some are just now closing out and we’ll soon be starting another round of projects with members. Cybersecurity is really big, as are projects with augmented realty and VR goggles. We’re doing great things in training the next workforce, from unskilled to skilled—how people are trained via digital instruction. There are lots of things that come out of that. 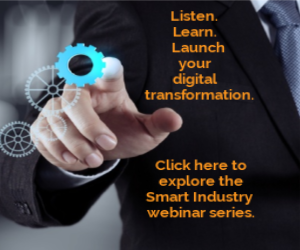 Smart Industry: What mindset do you bring to DMDII? Chandra: The majority of my life has been in the private sector. DMDII is a non-profit, but I hope to bring some of that business perspective—having outcomes that benefit the manufacturing ecosystem. I am a true believer in the importance of manufacturing to the U.S. economy. Digital is the future. Manufacturing can’t be successful if we’re not prepared for a very different future, and we’re often one of the slower adopters in this respect. We’re helping companies be quicker down that digital path. That is a mission I feel passionate about. Smart Industry: Based on your past role with U.S. Department of Commerce, how does the domestic attitude toward digitalization differ from foreign perspectives? Chandra: The US is well positioned, but I would be remiss to not address the huge advantage oversees in the EU and southeast Asia. The US is best overall in creating an environment for digitalization on the manufacturing side, but I worry about complacency domestically. This is why a national institute like DMDII is important. Listen to our sister publication Plant Services' podcast with Chandra here.